This recipe comes as a bit of a request. I felt a bit strange making it as we have a good and cheap taqueria nearby but at least they don’t serve shrimp tacos. I did have some mediocre shrimp tacos the other day so I really wasn’t expecting much from this recipe. And how wrong I was. This may have been the best shrimp I’ve ever had (I’m debating whether or not it’s better than Gamberi alla Cannavota). The shrimp were well browned and took on the flavorings of the aromatics perfectly. I’m going to segue here a bit and do a product anti-endorsement: whatever you do, don’t buy Whole Food’s Organic Corn Tortillas. We tried to use them to make tacos and they were nearly inedible. They were some of the worst corn tortillas I’ve ever eaten. On the plus side, the shrimp were good enough to eat without a tortilla wrapper. In fact, the shrimp in this recipe would be good enough served over rice of some sort. The only modification to the recipe I made was to add a step to brine the shrimp. It means that it takes slightly longer for the whole recipe (which is already very short) but it really helps with the flavor and texture of the shrimp. This has to be one of the best bang-for-your effort recipes I’ve seen in awhile. The shrimp are excellent and there’s very little work needed to make this. It’s also rather fast. It does create a bit of smoke however. Bring the water, salt, and sugar to a boil over high heat. Remove from the heat and pour into a bowl. Add the ice. When the ice has melted, add the shrimp and brine for 15 minutes. After 15 minutes, remove the shrimp from the bowl and dry thoroughly with paper towels. Heat a large sauté pan over high heat. When the pan is hot, add the oil and the onions. 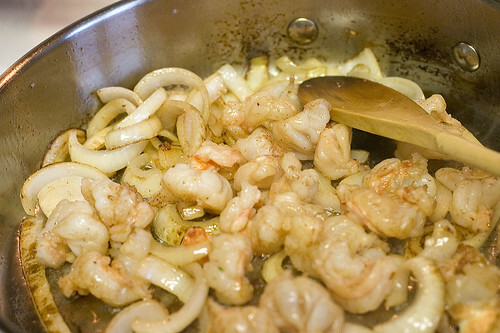 Stir the onions several times, then add the shrimp. Cook the shrimp for 1 to 1 1/2 minutes or until they start to turn red. Add the butter, jalapeño, and garlic and cook for 1 minute more. Remove from the heat. Adjust the seasoning to taste and stir in the parsley. Place the tortillas in stacks of two on plates. Divide the shrimp among the tortillas. This sounds delightfully simple and from the pictures, looks awesome. Its too bad the tortillas weren’t so good, but I really like the sound of this dish. 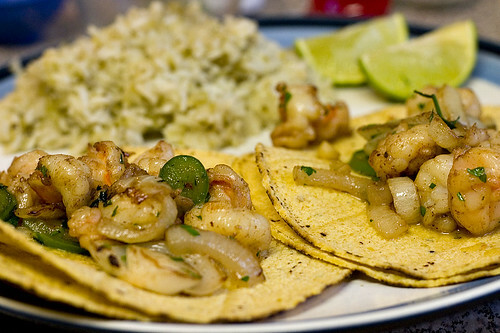 I’ll have to try it out–I’ve had fish tacos but never shrimp (yet)! Oh please don’t taunt me so with these shrimp tacos! It’s raining down here and I don’t want to go out and get corn tortillas like the golden ones you have here. Mike – Fish tacos are popular in my part of the world but my experience is that they’re a bit different. They’re both quite good however. 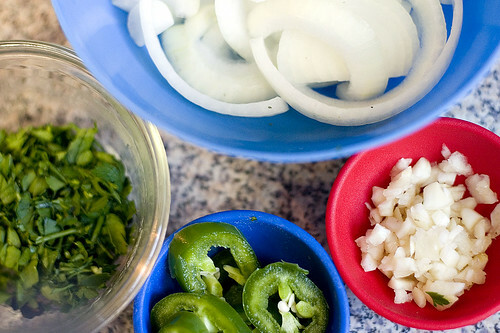 js – You don’t really need to eat them as tacos. You could easily serve the shrimp over rice. In fact, that’s more or less what we did as our tortillas were inedible. Oh. My. Gosh! These look absolutely divine! This recipe is different from other shrimp taco recipes I’ve seen before, and I really, really like how it all comes together. Great tip about the brining, too. YUM! These look sooooooo good. I’m saving this recipe! Those tacos look really tasty! I made these tacos for dinner earlier tonight and they were incredible. So full of flavor…the family loved them. Thanks for the recipe!! I will make these again and again.